At left, my desk right now. It is cold here. We haven't had any snow beyond the skiff type that stays in the grass yet this season. I was snowed-in on this date last year. It's more like an early November cold snap than a mid-winter day. The trees are naked in the wind yet resigned to the season. I'm less sure of myself. I have trout gear out and around right now. I want to improve the utility of some of the gear I have in order to have more "dash and go" fishing outings in the spring. Thus, organization. Right now: reels. 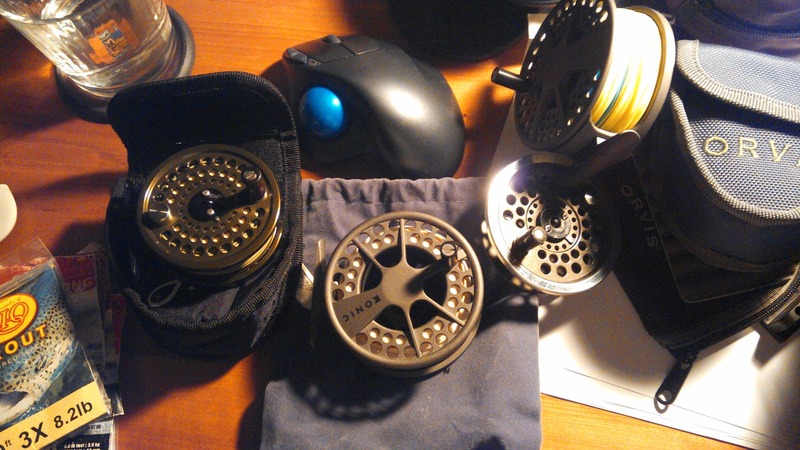 In this picture, an Abel tr1, a Lamson Konic I, a spool from a Scientific Angler 706, a Lamson Konic III, a Battenkill large arbor (in case). Also, a 2" pile of leaders in original packaging. I think I am going to move to braided cutthroat leaders this year. I like braided leaders and am too lazy to braid them anymore. Luckily, the folks at cutthroat sell some which are far better than my efforts. I bought a new Orvis Battenkill click-and-pawl last night for $70 shipped: never fished. These are great utility reels and I couldn't let this one in a 5wt size go. I'll spool a 5wt Wulff triangle taper on it and be ready for brown trout. Anyway, the writing is going fine. I wrote myself out of a hole this morning with a little help from my buddy Dean. He didn't know he helped me; but, he did. Sometimes the push to just move things forward helps the writer and meeting with Dean has helped me just move some things forward. I'm going to stand in cold water this year, catch trout, write murder, and have success at both. I've worked long enough at both that my efforts are going to yield success. I can't wait for brookie season. I can't wait to see how this novel turns out in the end. I hope you can't wait to pickup your rod for spring opener - after writing a few hundred more words. Remember, 6X leader is only 3 lb test. You have to play the words delicately or you'll break off your trophy brook trout or your reader.